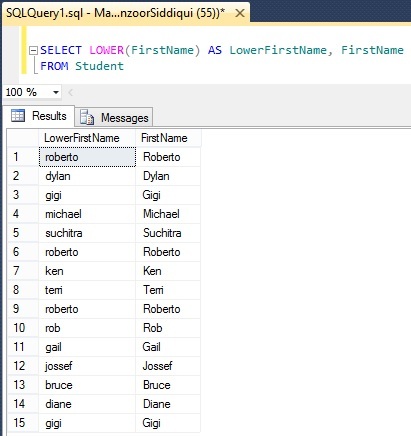 SQL LOWER() function is used to convert character string from upper case to lower case. Below is an example converting small letter character string to upper case. Upper case letter string ‘SQLServerLog.com’ is converted to lower case letter ‘sqlserverlog.com’ by using LOWER() function. In this manner you can use this function to compare strings or for application requirements. We will take one example from Student table as shown below. Here we are converting FirstName column to lower case letters. If you will compare two columns, FirstName and LowerFirstName both columns have same name but we have used LOWER() function in first column to get the FirstName column in lower case.